I was recently chatting to somebody about how I started oil pulling during my pregnancy and how it completely got rid of my morning sickness. I realised my experience could be helping a lot of people so I’m sharing it with you now in the hope it will help you or someone you know. During my first pregnancy I was lucky enough to not have any morning sickness but it was a different story during my second pregnancy. As soon as I realised I was pregnant I felt so sick, day and night – not just in the morning. It lasted all day long and made me feel so ill that I couldn’t do anything. I could barely eat, was struggling to look after my toddler and had to lie down for most of the day. I tried everything I could think of and did loads of research into treating morning sickness but nothing was working for me. Then I stumbled across oil pulling. I’d heard about it before but never really got around to giving it a try, so I decided I was going to give it a go. Everything was worth a try. I bought 2 books to read more on the subject. I bought Oil Pulling Therapy and Benefits of Coconut Oil books by Bruce Fife. I planned to do oil pulling with coconut oil and I wanted to read more about the benefits of coconut oil so that I could use my coconut oil for other things too. I would highly recommend reading these book as they explain all the theory behind oil pulling and why coconut oil is so good for you – which is actually really useful. There are so many benefits to these two practices. The books will also be able to answer more of your questions than I will be able to here. But if you don’t have the books, there’s nothing stopping you starting oil pulling right away. 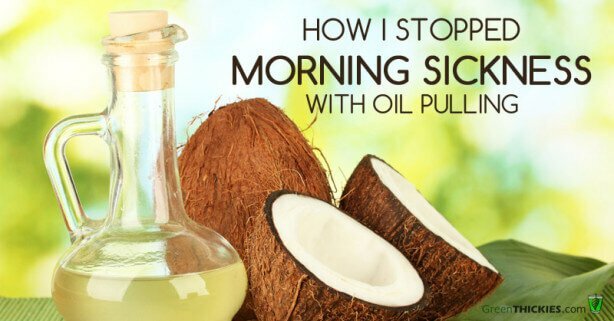 I’ll explain how to do oil pulling with coconut oil in a minute – but first I want to tell you about my experience. When I first started oil pulling, I actually felt worse for a couple of days. I had read that this could happen so I kept on going with it. My husband had to go away with work for 2 weeks and I was so ill I had to go and stay with my inlaws as I couldn’t cope on my own. I had been doing the oil pulling for a few days and barely slept just before our journey down to my inlaws which always made me feel a million times worse. But strangely enough on this day I actually felt really good for some strange reason. My morning sickness had totally gone and never returned. I still had a tough pregnancy but I was over the moon that I was no longer feeling sick all day long. The other benefit of my oil pulling was that I didn’t have any gum disease, tooth infections or cavities during my pregnancy. During my first pregnancy I’d had so many tooth problems, and I managed to avoid them all during this pregnancy. In fact when I went to the dentist she remarked on how healthy my teeth were and how I didn’t have any plaque and it was obvious I’d been looking after my teeth. Oil pulling involves swishing oil around your mouth to remove toxins. According to Bruce Fife, all disease starts in the mouth so if you have any health problems, you should start with your oral health. What does oil pulling cure? All you do is get some Olive Oil or Coconut Oil (1 teaspoon – 1 tablespoon) and swish it round your mouth for 20 minutes first thing in the morning. Don’t swallow it – just spit it out as it contains all the toxins. To melt the coconut oil, what I did was place the coconut oil in a mug, then place the mug in a bowl of boiling water until melted. To get maximum benefits – do oil pulling in the morning, before bed and if you can, in the middle of the day too. I have actually forgotten to do oil pulling since having my baby as I was too sleep deprived to remember to care for myself. So now I have tooth problems again, some pain and discomfort and an infection. So of course I’ve started oil pulling again. I am not planning on giving it up this time! It can be hard to squeeze in this practice taking 20 minutes when most of us are rushed off our feet in the morning – so this is what I do. I take my oil up to the bathroom (keep a bottle of olive oil up there all the time if you like) and I do my oil pulling while I’m having my bath or shower in the morning. This usually takes about 20 minutes so I fit it in perfectly. Just remember to tell your family what you are doing so they don’t try and talk to you while you are doing it! You can buy your coconut oil here or here which is perfect for oil pulling. If you want to read more about these subjects in depth you can buy Oil Pulling Therapy and Benefits of Coconut Oil books by Bruce Fife. Have you ever tried oil pulling? Did you notice any benefits? With all 3 of my pregnancies I had horrible morning sickness- which also lasted ALL day! I know how it feels and I wish I would have tried this out! But it is really good to know and in general I may just give it a try. I also assume the coconut oil tastes better than olive oil, but are the results the same or is one better than the other to use? Hi Rena, yes the coconut oil tastes better and it is more beneficial for healing of the mouth, but it’s easier to use olive oil so if that motivates you to continue – just use the olive oil. I started oil pulling and had to stop because I’m breast-feeding. I’m really bummed bc I have horrible morning sickness the entire pregnancy. My teeth are also in poor shape. I’ll be able to start again in about 4 years, depending on whether we stop after the next baby and how long they nurse. I am breast feeding too but I believe the body detoxes all the time and I’d rather the toxins out of my mouth than in. If I don’t heal my tooth infection I’ll have to take antibiotics which I think would be worse for my baby. You have to do what you think is right though. 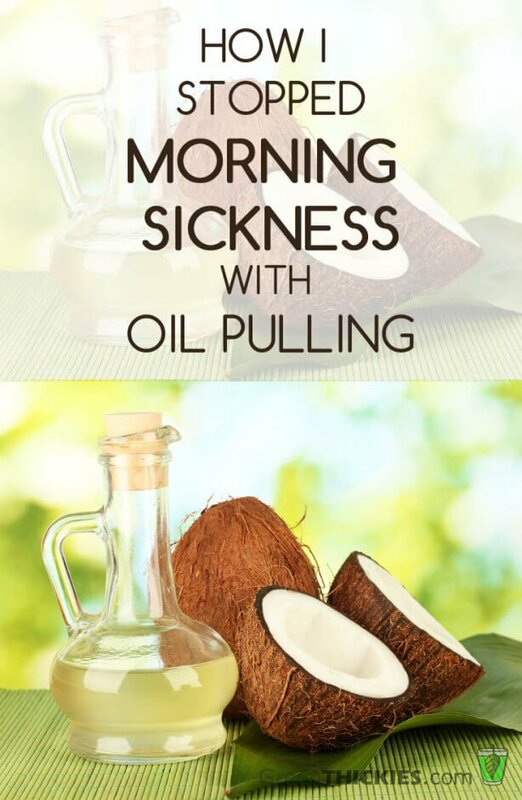 I have tried oil pulling, and I did notice that any congestion I had upon waking would be a lot easier to cough up or I could blow my nose to get rid of it. I have always had pretty good teeth (either genetically or because of my diet or both)-I’ve only had one tiny cavity they filled without using anything to numb it. I don’t do it religiously, so I haven’t noticed my teeth getting any whiter or the plaque going away, but I would love to try it regularly now!I usually do it when I am starting to get a respiratory infection to try to keep from going to the doctor. I love doing it and I’m definitely going to try to make it a habit now that I’m pregnant and I know more of the benefits! I’m curious about how you managed to oil pull at the beginning when you still had morning sickness. I’m not pregnant, and have tried oil pulling a few times- and had a really hard time getting to even ten minutes with the oil in my mouth. I kept gagging the whole time. And when I was pregnant I had a hard enough time brushing my teeth without gagging or throwing up. i love to pull with peppermint coconut oil, from skinny coconut oil company. it tastes really good and my kids eat it too! I am 23 weeks pregnant now and was throwing up to week 14, then started using No to morning sickness tea which helped and ended up my sickness.